An Unwavering Focus on Safety and Environmental Responsibility. Sadoff Iron & Metal offers scrap metal recycling of non-ferrous metals and ferrous scrap, auto salvage, electronics recycling, and more. Our multiple locations provide exceptional recycled products and programs for steel mills, foundries, smelters, and many others. Get the latest news in recycling and sustainability from your locally-operated recycling company. Your Security is at Stake! Materials we accept—ferrous metals, non-ferrous metals, and more! We’ll purchase your scrap metal, make the planet more green, and make YOU some green, too. We’re a certified supplier of premium specialty scrap metal, backed by integrity and professional service. What is “Down To Earth” Recycling? 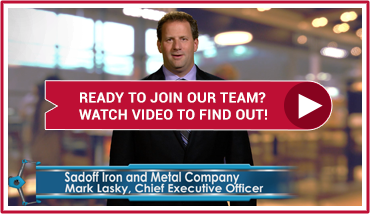 Sadoff Iron & Metal combines our environmental responsibility with easy-going, customer-focused attention. For you, “Down To Earth” makes things easy, comfortable and, ultimately, it boosts your bottom-line.